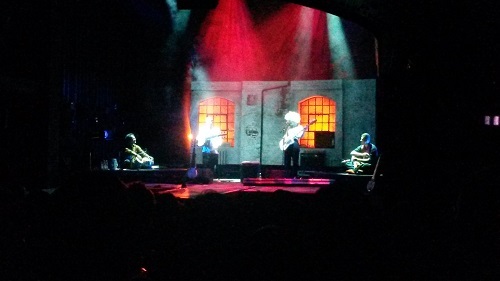 IT WAS something of a balmy evening outside and there was a heady sense of excitement and anticipation inside the Royal Court Theatre in London as the audience settled down for “Fretless Nomad“. Nothing unusual there – but this was not any sort of conventional drama – in fact it was where an Indian instrument took centre stage for the first time in something of a historic moment, probably, on Sunday (June 22). The stage design was evocative and atmospheric, and we could have been in far off lands in the 18th century. 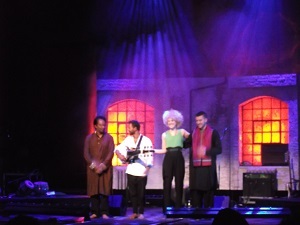 Soumik Datta possesses wisdom far beyond his years with the sarod in his hands. It is an instrument of agility, poise, and above all, sweet communication. Seductive, mellifluous, energetic, radiant, the tempo can be upbeat and almost rocky, but equally it can step back and be a calm, quiet accompaniment; a soothing presence to more vivid, powerful expressions of sound and tension. Yet this was no ordinary concert – for it could not be staged at the Royal Court – without a sense of more conventional drama. And that came as Datta described how the sarod first entered the world. It was adapted from an Afghan instrument, called the rabab and its entry into India was in some respects inauspicious. As you might expect this was not simply at a level of theory – enter 17-year-old Saphwat Simab. Again in his hands, the rabab dispels notions of youth and naivety, and takes on the air of maturity and knowledge bestowed on it by at least three centuries and counting. In came the tabla with Shahbaz Hussain, giving the music a strongly traditional and unmistakeably sub-continental feel. As if to shake things up and show the trio of instruments’ contemporary malleability, Datta described his first encounter at university with a voice. Not just any voice – as dexterous and honeyed as any bird’s in nature. The folksy singer’s voice has a range and quality which brings a different form of conversation to proceedings as the rabab, sarod and tabla all let Bevan go in high and grandly and time seems but a concept to be viewed sceptically. You have three instruments of relative lore communing with a voice which has a delicious contemporary edge and you almost need no book to tell you that crossing frontiers and encountering difference and adapting is what life is, and should be, about. It was not a long performance – perhaps just over 60 minutes but intense, and engaging. If anything, Datta can introduce more exposition and explanation: he’s a capable narrator and there’s probably more to this story than meets the eye or hits the ear. 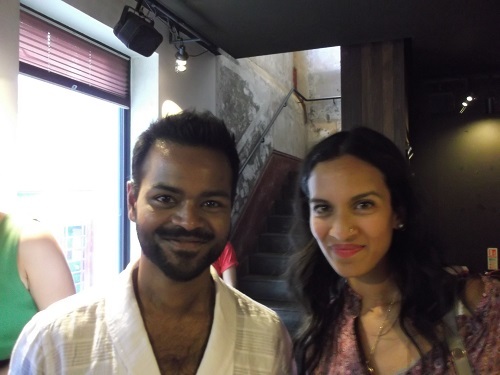 Introduced by Sir David Green, chairman of Soumik Datta Arts and sponsored by the Bagri Foundation with the very personal input of Alka Bagri (see preview), it was a memorable and rather special night. At present the tracks sung by Bevan have not been recorded and so it was a one-off in that sense too. As yet there are no plans to stage “Fretless Nomad” again, but Datta and Bevan, who became friends at University College London (UCL), are a rich combination and and while both are established in their respective fields, there’s a real sense of excitement and energy in bringing two different styles together so memorably.